When the natural products industry began to mature and started using science based claims for their ingredients, formulations and products, they gave up a very big advantage they had. That advantage was in the obvious connection between good food and good health. Food was cool back in 431 BC when Hippocrates allegedly admonished us to make food our medicine and medicine our food. This food as medicine connection has been deeply rooted throughout human history. Food and nutrition were the at the root so to speak, of ‘natural’ products. This was somewhat of a backlash against large scale processed foods that started taking on forms that were unrecognizable, yet immensely compelling from the standpoint of convenience and taste. As the market grew, it became necessary to address convenience, efficacy and safety factors. Distinguishing natural remedies as ‘just as good as’ or ‘better’ than pharmaceuticals, the need for scientific validation for the claims to good health became more important than the common sense experiences traditionally associated or attributed to their use. The results have been mixed. We have a treasure trove of existing and ongoing science supporting food as medicine. Yet we can’t say so for fear of running afoul of some Federal regulation or monopolistic protection. Drug companies buy up nearly every inch of ad space in scientific journals, so the argument persists that there’s little scientific basis for natural product claims. If a tree falls in the forest and no one hears it . . .
We have good manufacturing practices and we have dozens of third party certification organizations. The message to the consumer is that there must be a problem with food standards somewhere. In the meantime, we’ve seen a proliferation of new ingredients, formulations and products clamoring for shelf space. Consumers have never had so many choices, yet confusion has never been greater. They don’t understand the reason behind pricing for the same item from different manufacturers. The whole shopping experience can be overwhelming and intimidating. Most of this confusion could have been avoided. If the industry had led with nature as the gold standard, we could have more easily validated our claims to efficacy and safety. Instead of copying big pharma’s model, we could have copied nature’s. Many pharmaceuticals were derived from plants from nature. We could have framed big phama as copying nature and following those of us with a food and nutrition based approach to health instead of playing the never-catch-up with their marketing and budgets game. .
Now we have an arms race to invent and patent more and more products designed for a specific effects. We pile on tons of scientific evidence and expect consumers to feel secure in their purchases. We can’t say ‘ask your doctor’ if product ‘X’ is right for you because there are too few doctors who know what to answer. Based on the amount of nutrition education they were exposed to in medical school, most doctors look like a deer in the headlights when a patient asks a nutritional question. It’s no wonder we’re in such a sorry state of health. Don’t despair. It’s not as difficult as it seems. Self education is the first step to understanding how food and nutrition are essential to optimal health. After all, they don’t call them “vitamins” for nothing. Fortunately, consumer awareness about the medicinal benefits of knowing about food and how to best use it for our optimal health, is a secret that’s no longer so secret. Despite attempts to separate us from food’s full story, consumers are causing a major upheaval in the food and consumer packaged goods sector. This is good news for food and nutritional supplement manufacturers. There’s a pretty compelling story to tell about their products. The more the good food story is told and circulated, the faster new shelf space will appear. In the stores, on the web and ultimately on consumers pantry shelves. A short time ago the US Department of Agriculture (USDA) announced that it has agreed to allow Forage Genetics International (FGI) to begin commercial planting of its genetically engineered (GE) alfalfa which has been designed to tolerate Monsanto’s herbicide known as Roundup. This comes as no surprise to the organic community but what is most distressing is that FGI will be allowed to conduct commercial planting of this new GE crop without any federal requirements to prevent the contamination of non GE alfalfa fields. The impact of this ruling is far reaching to organic farmers across the board. The legislated organic standards prohibit any presence of GE material in organic crops. This makes perfect sense since consumers who demand organic produce have a right to be protected against GE contamination. But yet, federal authorities continue to allow GE crops to proliferate unchecked. It’s a serious issue and not just for organic farmers. It was found by the Union of Concerned Scientists (UCS) that cross pollination between GE and non-GE crops is occurring. This finding opens up the very real possibility that our consumable crops are also being contaminated by pharmaceutical based DNA. What does that mean? For the past decade, big pharmaceutical companies have been genetically modifying plant crops to produce drugs. But as stated earlier, there are no regulations to protect against the possible contamination of non-GE crops by nearby GE crops. Let me provide a superb example outlined by UCS. Let’s say a big pharma is growing corn with the ability to produce a drug such as a growth hormone. The pollen from this GE crop is carried through the air pollinating nearby non-GE corn destined for human consumption. The farmer of the non-GE corn harvests his seeds some of which are now genetically modified. These seeds are sold to a farmer who then grows the corn for human consumption not knowing that some of the corn is actually GE corn. Some of this GE corn might have the genetic sequence for growth hormone production or might actually have growth hormone in the corn kernels. The consumer then purchases this corn and is unwittingly contaminating themselves and their family with a pharmaceutical drug. This is a very real possibility yet there are zero regulations in place to protect against this type of contamination. Monsanto has a market cap of $40 billion and did $10.5 billion in sales in fiscal year 2010. They are big, they are powerful and they have used their power very aggressively against anti-GMO activists. But the bottom line is organic produce has grown from $1 billion in 1990 to approximately $23 billion today. Individuals such as you and I have spoken loud and clear. We want organic produce. But the disconcerting issue is that if Monsanto continues to get its way, organic production may become compromised. If we want to protect our right to choose, we must stand up and be heard. We must say no to the unchecked proliferation of GE crops. Will you make your voice heard? If you want to join the growing movement against GE crops then go take a look at the Organic Consumers Association campaign here: http://www.organicconsumers.org/monsanto/. They are looking for volunteers to help spread the word to legislators that we want the right to choose and that ability to choose must start with proper labeling of produce. After all, if foods do not have to be labelled as GE, how can you choose to say no to GE foods? That’s why Alberta farmers are working to establish a GM-Free alfalfa zone. in the Peace River region. Genetically Engineered Salmon Has Reached The Dinner Table. This thanks to our friends at Nature News. AquaBounty Technologies, the company in Maynard, Massachusetts, that developed the fish, announced on 4 August that it has sold some 4.5 tonnes of its hotly debated product to customers in Canada. The abundance of package claims and ingredient complexities across the FMCG landscape puts a burden on consumers. Not only do they need to decipher and decode, they also need to determine which claims are most relevant to their needs. For many, the approach is simple: Buy from companies that are more transparent and clear in their claims and labels. The bottom line is that transparency and clean label are not point-in-time fads. It looks like big food and big ag has gotten so big and so complicated, that consumers are having a hard time figuring out if their purchasing criteria are a match for their values. Consumers are paying more attention to what they buy—and that goes for foods, beverages and non-food categories like personal care, vitamins and supplements. They’re paying so much attention that our entire processed food system is under consumer review. Local food, farm to fork, sustainable practices and social equity are all becoming part of the buying process for American consumers. The natural products industry has long been in the lead when it comes to developing clean labels and good manufacturing processes. That’s because their customers always expected as much. The mainstream packaged goods companies have been quite late to this opportunity. Their approach has been to green wash their products, announce a reformulation, sell themselves to a larger conglomerate or acquire a natural product company. Despite the growing use of the term “clean” to describe products across the fast moving consumer goods space, there is no universally accepted definition for what constitutes a clean product. Just like “natural”. However, in order to provide some analytical rigor to this term and to understand how sales have shifted toward cleaner products, our friends at Nielsen and Label Insight have created a progressive definition of clean label, shown in the chart at left. Thanks a bunch guys. You can’t tell the players without a scorecard. We live in a world with unending information. Given the state of information flooding the world we now live in, success for packaged goods manufacturers will depend on clear communication with consumers and a focus on what matters to them. The number one thing above all others is not to have those products harm the planet or injure the consumer. That’s a very tall order and it’s causing all the disruption we’re seeing in the food space. Clean label is a spectrum, and companies need to know where the shifts are happening. The bottom line is that transparency and clean label are not point-in-time fads. They have gone mainstream and competition for consumers seeking clarity, purity and responsibility is only going to increase. The cleaner the better. From a consumer-centric view, that’s what playing the “Is It Healthy?” game looks like. Do You Know What The Label On Your Eggs Really Means? What kind of eggs do you want? Brown eggs, cage-free eggs, free-range eggs, natural eggs? When you go to the store, you’re assaulted by more than a half dozen choices. Some of those terms aren’t even regulated. So how do you know what eggs are best for you? Do you think cage-free is the way to go? If you’ve ever gotten fresh eggs directly from a farm, you probably know that color really doesn’t mean anything. 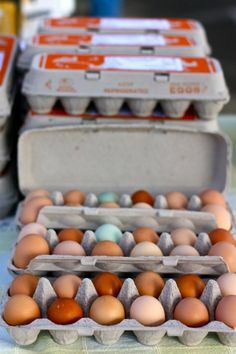 When I get eggs direct from a farmer, I get a dozen different colors. Some chickens even lay blue eggs. An egg’s color has absolutely nothing to do with nutritional value, so don’t worry about picking brown eggs. The chickens that make these eggs are force-fed a plant-based diet. So if you’re looking for humanely-treated eggs from chickens that got to choose what they eat, leave these in the refrigerator section. This term is yet to be regulated by the FDA. As of right now, it’s simply a marketing term that can be used as long as it’s relatively true. All eggs can be considered natural because they all come from chickens and aren’t manufactured. So don’t let this term trick you into paying a premium price. It’s sad, but these chickens aren’t much better off than their caged counterparts. They often live in multi-level aviaries. As you’d think, they don’t have to have access to the outdoors to be able to use this on the label. These chickens are not running freely around a yard eating whatever they want. Surely these chickens can run around and eat whatever they want though… Well, that’s not entirely inaccurate. To qualify for free-range, the chickens simply have to have access to the outdoors. They don’t actually have to go outside their cages. A chicken is going to do what it wants to do. Unfortunately, many of them will stay in their cage and not go outside. It’s best to assume people are trying to trick you at this point. And they are. To qualify for organic, the hens just have to be fed an organic diet. So at least you’ll get better nutrition than a regular egg. Bit unless there’s something else on the label that denotes otherwise, these chickens are probably still living in a cage. Finally, these are the eggs you’re looking for. It’s going to cost you a lot more though. But, these chickens are raised more humanely than their counterparts, they get plenty of access to the outdoors, and they can eat the bugs and seeds and whatever else they find in the yard. Unfortunately, this term is not yet regulated by the FDA either. So you’d be wise to call the farmer or stop by for a visit. There are plenty of farmers that raise chickens and sell eggs. By buying directly from a farmer, not only are you supporting your local economy, but you’ll also be able to see the hens that are laying the eggs. You’ll know exactly what you’re getting. Of course, it’s going to cost about $5 a dozen. But if the farmer is providing you with eggs from hens that get to roam around the yard, these eggs are going to be a lot more nutritious than the other eggs that are available in your grocery store (excluding pasture-raised because they’re probably on the same level). If you have access to local fresh eggs, $5 a dozen is a lot to ask for something you can pay just over $1 for. If you can’t afford $5 a dozen, then make your selection based on what you can afford and the guide above. School’s in session and more kids are learning, growing, and playing fueled by good-tasting whole grains! Lately, there have been big wins in the movement to improve school lunches, and Community Grains is proud to be doing their part. Oakland Unified School District has decided to go all in with Community Grains’ California-grown, 100% whole grain pastas,now on cafeteria lunch menus in 85 Oakland public schools! And in yet another fantastic move, OUSD is set to adopt a Good Food Purchasing Policy — a purchasing standard that demonstrates its commitment to better sourcing, sustainability, fair labor, and quality whole foods. On the national front, the USDA recently formalized new school nutrition rules under the groundbreaking Healthy, Hunger-free Kids Act. There’s much work to be done, but it seems clear that the local school wellness policies are making a big difference. Parents who remember their school lunches may be jealous but this is great news for kids. We’re so pleased and encouraged, we could hit the playground ourselves!